Bearing the above statement in mind, no one (including our current crop of world leaders) seriously disputes that it was the unfettered-greed of a minority of charlatan banksters, coupled with the abject failure of regulators to hold these pin-striped saboteurs to account, which triggered the current world economic crisis. Unfortunately, our leaders don't seem to have yet realized that, it was at similar times of mass-vulnerability that previous generations failed to recognize the most-obvious of charlatans and widely-accepted them as authentic saviours. The current governor of the Bank of Canada and Chairman of the G20's 'Financial Stability Board,' is Canadian, Mark Joseph Carney (b. 1965). He has lately been heralded by the current British Chancellor of the Exchequer, George Osborne, and Prime Minister, David Cameron, as a nothing less than an economic saviour. 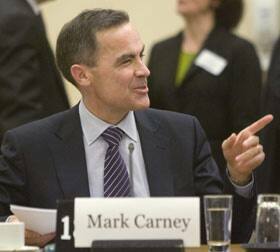 Consequently, Mr. Carney is due to take up the office of Governor of the Bank of England, July 1st, 2013. He will be the first foreign-born holder of this office and it has been announced that Mr. Carney will receive an annual salary (financed by UK tax-payers) approaching US$1 million (approximately double the remuneration of his predecessor). Whilst with Goldman Sachs, Mr. Carney worked on South Africa's post-apartheid venture into international bond markets. Mr. Carney was involved in Goldman Sachs' controversial role in the 1998 Russian financial crisis. At this time, whilst employees of Goldman Sachs were acting as advisers to Russia, other agents of the bank were quietly placing massive bets against the country's capacity to repay its debt. To put this into context, imagine the 1998 Russian financial crisis as a rigged sporting event. Ironically, Mr. Carney is a former (reserve) goalkeeper for the Harvard University ice hockey team. Once upon a time, there was the end of the world.